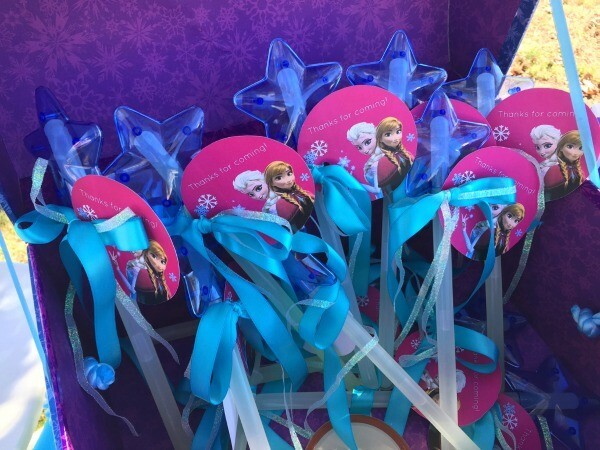 Disney's Frozen Birthday Party Ideas: Pink, Purple, Blue, & A Jumper, Too! 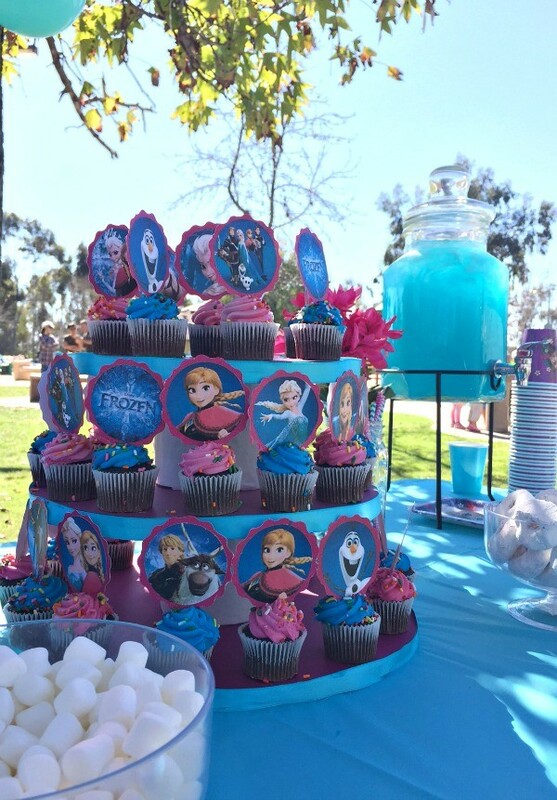 Frozen Birthday Party Ideas: Pink, Purple, Blue, and a Jumper, Too! 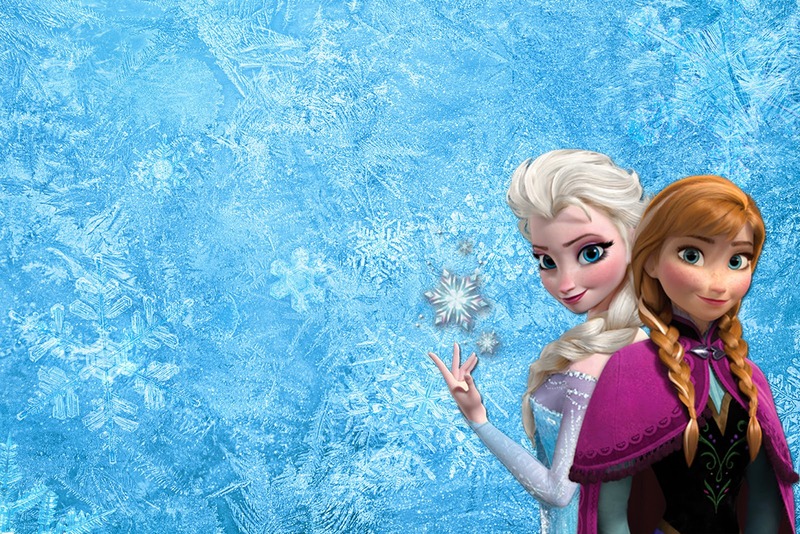 Having a Disney Frozen party for your little princess? 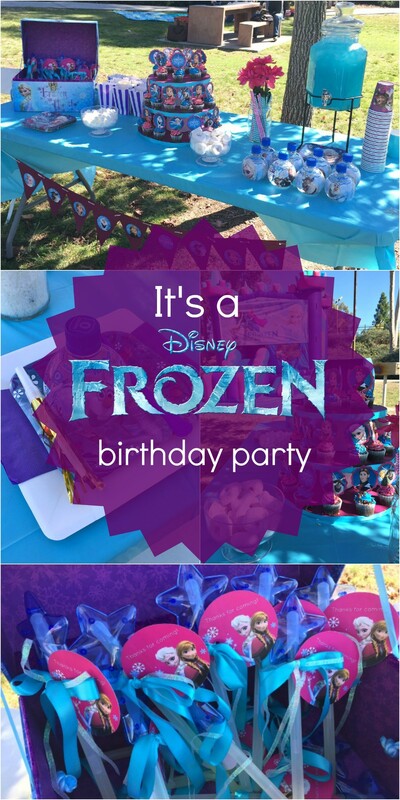 These Disney’s Frozen birthday party ideas are so much fun, I used the colors pink, purple, and blue to make a super awesome birthday theme! 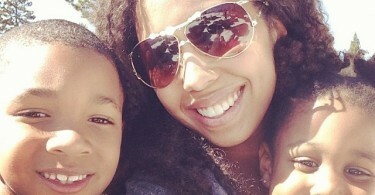 I can’t believe that my daughter is already 4! 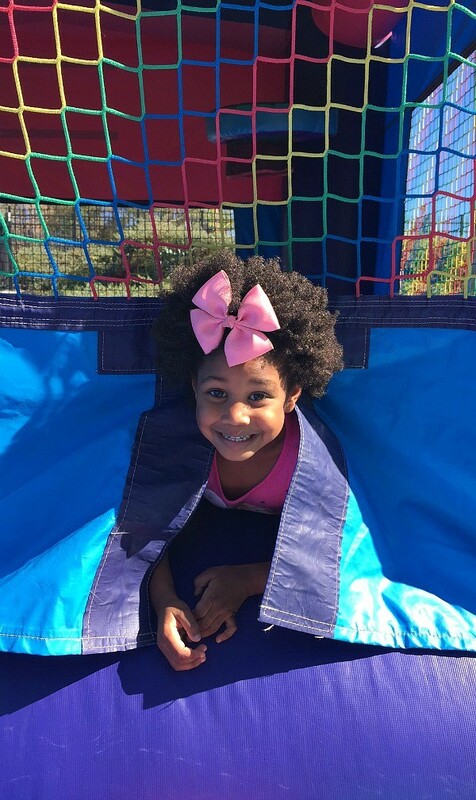 We had a cute Frozen birthday party for her at our local park playground, complete with a jumper, food, sweets and plenty of friends. 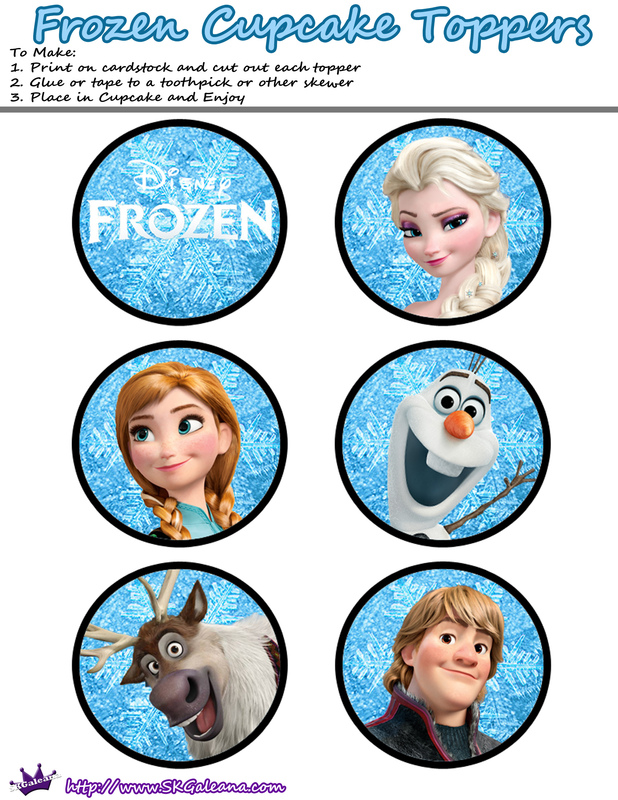 Here is our cute Frozen birthday party ideas and decorations I love how it turned out! Ahhh, the Frozen obsession. 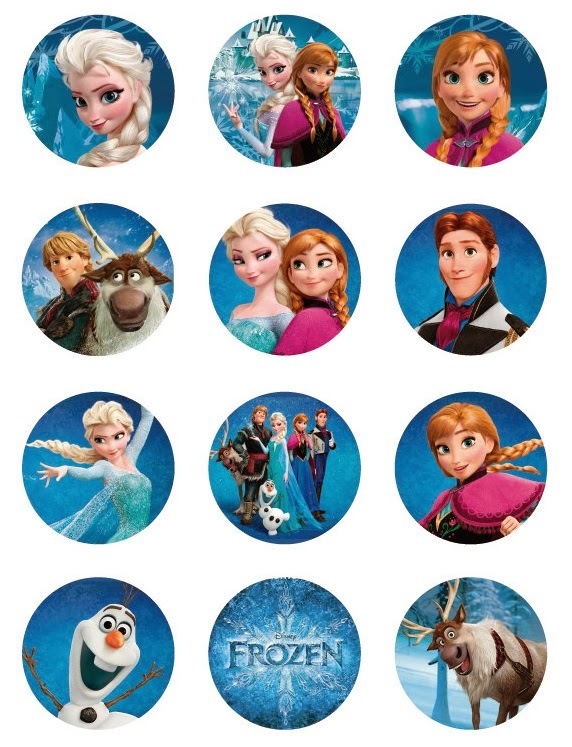 Plaguing the homes of girls and boys worldwide, Anna, Elsa, Olaf and the whole crew have taken over. 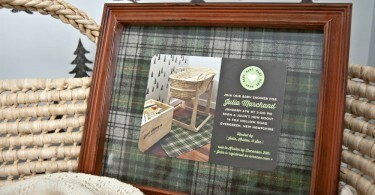 I created this on the computer, using a free printable invitation and the Picmonkey online photo editor. This way, you can print it out on thick card stock to hand out, or just send the invitation via email. I did both. I love how the sweets table turned out. The centerpiece is a cupcake stand that I made (super easy! ), and I found these pink and blue cupcakes that matched perfectly! 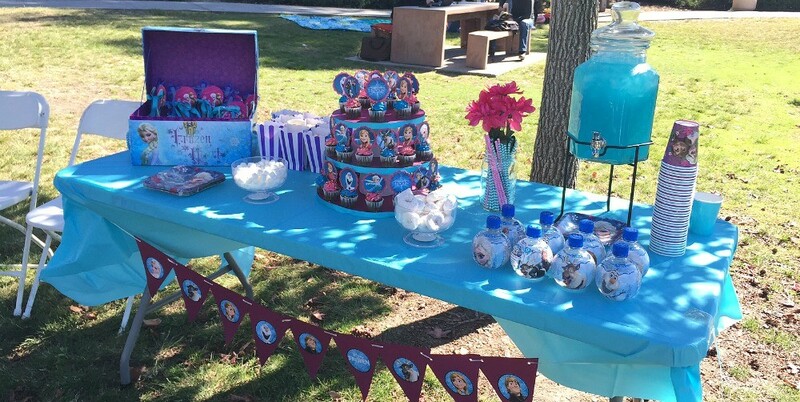 I used a simple blue table cloth, Frozen cups and plates, printed out cupcake toppers and made a banner. The Frozen blue punch is actually just blue Hawaiian Punch, and I love the Frozen themed AquaBall flavored waters! I placed chevron paper straws in the centerpiece, and on the left, I put a Frozen chest as decor and filled it with magic wand party favors that I made out of dollar store glow wands (see below). Other sweets included powdered donuts as snow balls, marshmallows, and popcorn in purple and white striped popcorn bags. 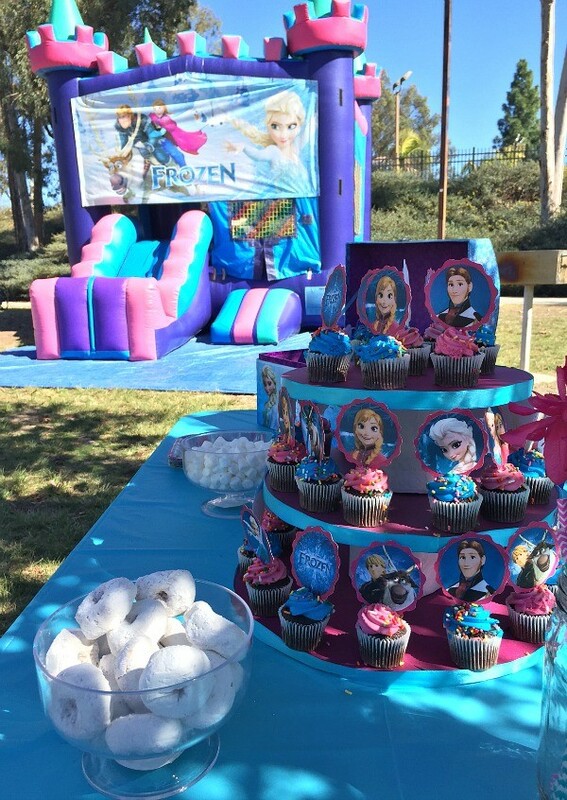 I used Jump 4 Adan party rentals in San Diego, CA for this cute Frozen castle jumper, tables and chairs. It was perfect, this one is a combo jumper with a basketball hoop inside and a slide to get out. I do recommend them, they were on time, courteous and professional, and got everything done 100%! The kids wore themselves out! 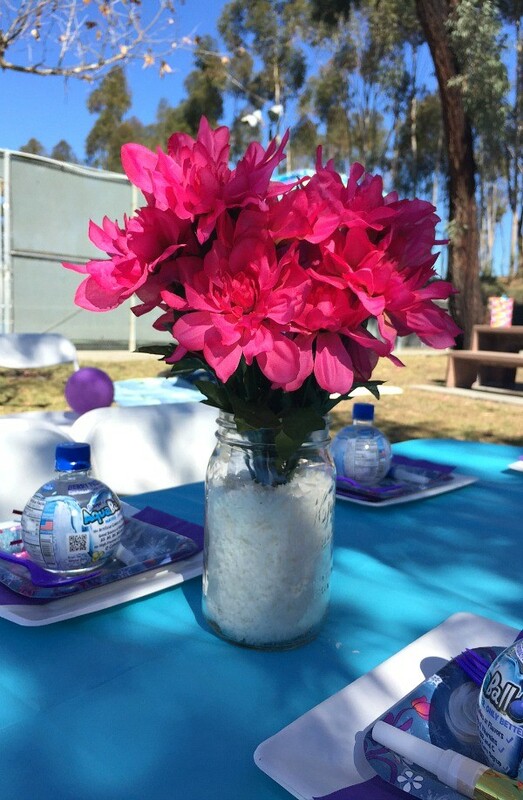 This simple floral centerpiece turned out to be cute, it matched the theme very well! All I did was get artificial flowers, coconut to look like snow, and throw it all in a mason jar. 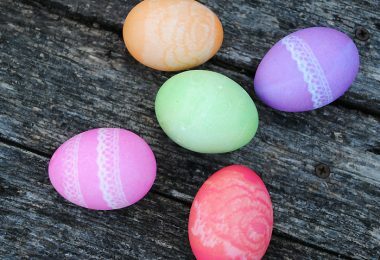 Next time, I will adorn them with ribbon around the neck of the jar. I made individual place settings for the kids table: large plates, beverage napkins, small Frozen themed plates, a fork, a blow horn, and an AquaBall water made this a simple and inexpensive place setting. AquaBall sent over a case of their waters for the party, they were a hit! This was an easy addition. 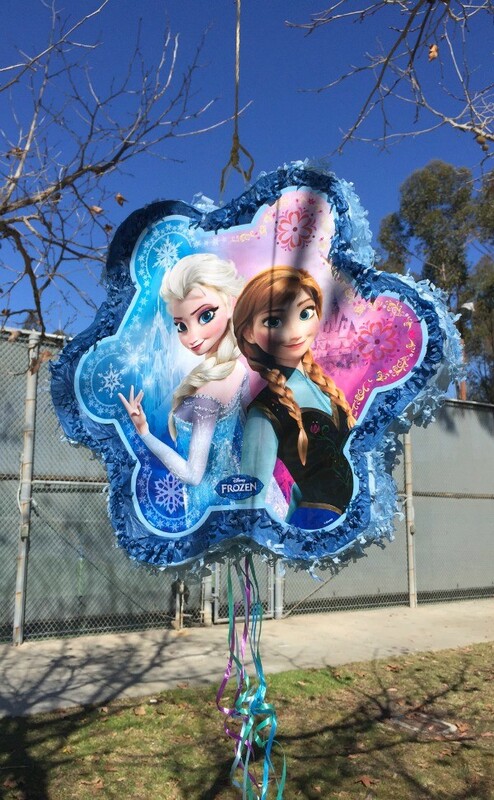 I found this Frozen themed pinata at Walmart, filled it with candy and let the kids have at it! A visit to the dollar store and a quick printable favor tag made these simple, cheap Frozen party favors for kids. Take a star glow wand, punch a hole in your favor tag, tie some ribbon into a bow around the neck, through the hole of the favor tag, and you’ve got yourself a party favor! 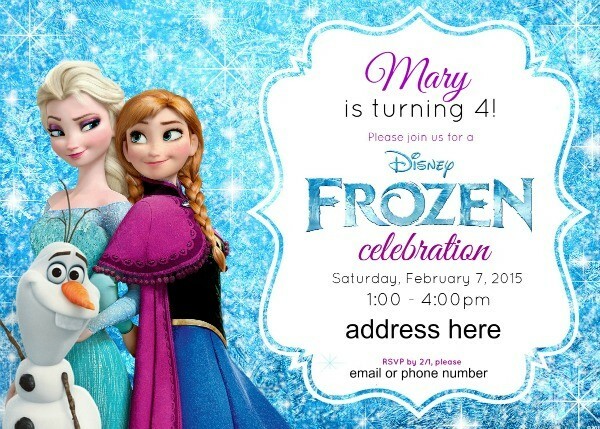 Disney’s Frozen Invitation template – found on Pinterest, no source so let me know if it’s yours! So, what do you think of my daughter’s Frozen themed party? You did a fantastic job, clearly done with love for your daughter. How do you make the blue punch? 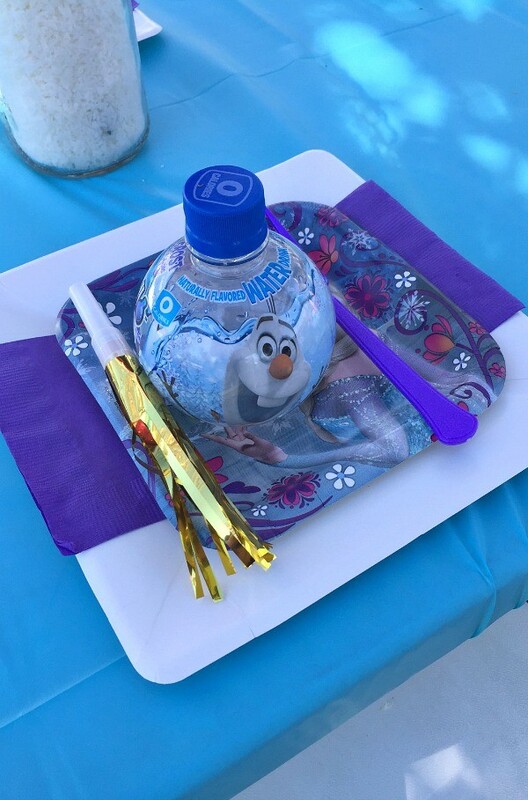 Man, it’s 2015 and Frozen is still a thing.lols Although I do love the color combination of a Frozen themed party. Are those powdered donuts?